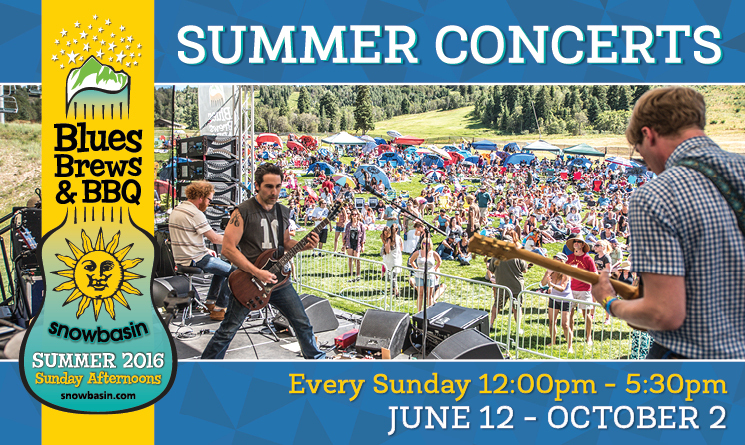 Snowbasin, Utah – May 11, 2016 – Snowbasin Resort has announced the full lineup of the fourth annual Blues, Brews & BBQ Free Summer Concert Series. Free, live music will rock Earl’s Lodge patio and lawn every Sunday 12:00pm – 5:30pm from June 12 through October 2, 2016. Three bands will perform each week, playing everything from blues to funk and Americana to rock and roll, offering a family-friendly environment everyone will enjoy. Award-winning BBQ will also be available in Earl’s Lodge along with a variety of local beer on tap. Needles Gondola will run 10:00am – 6:00pm Saturdays and Sundays starting June 11 for sightseeing, hiking, mountain biking and mountain-top dining. The outdoor concerts, performed rain or shine, are family-friendly and guests are welcome to bring blankets and chairs. For more information, please visit http://www.snowbasin.com or call 801.620.1000.